Home » Celebrities » Brad Pitt ruined Jennifer Aniston's life, so why are we still pining for their reconciliation? 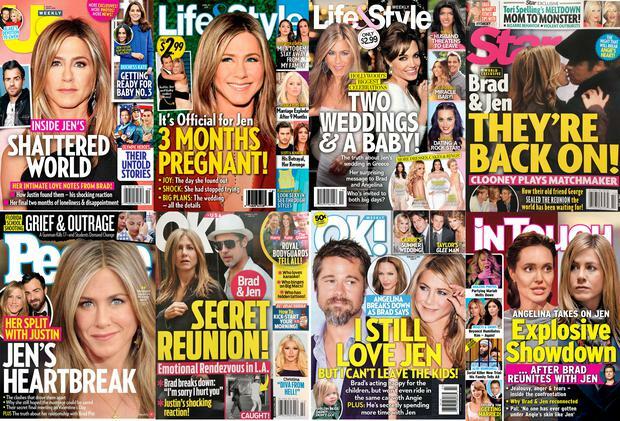 02/12/2019 Celebrities Comments Off on Brad Pitt ruined Jennifer Aniston's life, so why are we still pining for their reconciliation? In order to understand just how deep the Brangelina vs Jen An story goes, we need to take a short history lesson. In 2004, Pitt met Jolie, then his co-star on the set of Mr & Mrs Smith and there were constant reports of the insatiable chemistry between the two, this, despite the fact that he was married to Aniston at the time. She was America’s Sweetheart, he was the biggest movie star in the world and theirs was a union so widely beloved that even their agents who set them up on their first date in 1998 couldn’t have predicted what a behemoth their lives would become. They were unstoppable and so it seemed, madly in love. Before social media, they announced their engagement at a Sting concert in New York with Brad proudly dragging his new fiancée on stage to show off her diamond ring while she blushed with glee beside him. By 2000, they wed in a lavish ceremony on the grounds of a coastal estate in Malibu, attended by 200 guests and rumoured to have cost $1m. She vowed to always make his favourite banana milkshake and he promised to always split the difference on the thermostat. Reports from guests suggest it was a wild night celebrating true love, the antithesis to the Hollywood cliché. Despite making their engagement public, they soon realised the voracious appetite for details of their personal life and released only one black and white picture from their big day, one which fuelled pregnancy announcements because Brad was slightly gazing towards her stomach and without factual information to go on, the rumour mill went wild. This type of reporting would follow both of them around to the present day. Four years after that California wedding of dreams, a guest appearance on Friends and Jennifer’s public discussion of her desire to start a family later, Pitt began filming opposite Jolie. He has always maintained there was no cheating, the timeline has always been somewhat suspicious. This was three years after her marriage breakdown and still, the public fascination was incomparable to any other movie star, even to this day. At the time, tabloids were unwavering in their criticism and relentless in their pursuit: digital publishing was still relatively new, but it allowed for the creation of the first wave of bloggers were making names for themselves and of course, the introduction of TMZ in 2007 changed everything. A 24/7 celebrity news cycle was born. Largely because of the circumstances under which her marriage ended, Aniston has always been painted as a figure of pity (if you think it’s bad now, imagine what 2005 was like). It was the start of celebrity culture as we know as it and remains a clear pinpoint as to when the overly invasive interest in public figures began to take hold, notably in a pre-social media age. In an interview with Vanity Fair entitled ‘The Unsinkable Jennifer Aniston’, she detailed her marriage breakdown, only describing him as “having a sensitivity chip missing” when asked about his happy-families spread with Jolie in W magazine. It was published six months after they announced their divorce and remains one of the most talked-about magazine features throughout the noughties. The impossible-to-ignore glamour of Brangelina became a cultural movement all its own, while Jennifer was simultaneously painted as a victim and as the one responsible for her marriage breakdown: what did she do to drive him into the arms of another woman? Most tabloids came to the conclusion it was because he wanted a family – a large one – and Angelina facilitated that faster than his wife. The fact that Aniston doesn’t have children is regularly used as a stick to beat her with and she has alluded to the fact that not being a mother was not her choice. Over the next few years, Brangelina continued apace having six children in total, while she pursued her advocacy work and he focused on acting and developing rich person hobbies like architecture. Meanwhile, Jennifer was dating, as most single people tend to, before eventually marrying Justin Theroux in 2016, and such was the interest in her that she wrote an out-of-character op-ed for the Huffington Post hitting out at the ‘poor Jen narrative’ which has followed her throughout most of her career, in particular when speculation mounted that she was expecting a child after pictures of her sporting a non-perfect six pack were taken. “For the record, I am not pregnant. What I am is fed up…The way I am portrayed by the media is simply a reflection of how we see and portray women in general, measured against some warped standard of beauty,” she wrote. It had seemed that finally, Jen had found her man and while the same titles would continue to question the stability of her second marriage, which made it all the more crushing when they split last year. Aniston’s extraordinary fortune and illustrious career is proof she is the opposite of unlucky, but just that some marriages don’t make it to the finishing line. Despite the fact that public favour largely remains on her side, she has never deflected ownership of the breakdown of either of her marriages, telling InStyle last year, “The misconceptions are ‘Jen can’t keep a man’ and ‘Jen refuses to have a baby because she’s selfish and committed to her career’. Or that I’m sad and heartbroken,” she said. Now, she is celebrating her milestone 50th birthday with – of all people – Brad Pitt. As expected, the internet went berserk. The news was trending across social media all weekend and those celebrity followers still rooting for the couple had fresh hope there could be a reconciliation after all, two years after his marriage to Jolie ended. The choice to invite him was surprising in many ways, but tactical in others. Apparently he was invited by a mutual friend who extended the invite on her behalf, but you have to wonder what the motivation was. Aniston famously throws parties nearly always at her expansive home where she has complete privacy and keeps her circle of friends extraordinarily tight, so the decision alone to have the event at the very public Sunset Tower Hotel with a guestlist that could rival the Oscars was enough to capture attention from the paparazzi culture she is so often victimised by. But the decision to invite Brad, a man whose ghost has haunted her for 14 years, at the most public event she’s ever thrown? She is thriving, personally and professionally, not to mention the fact that she seems to be ageing in reverse. Inviting your ex-husband to the biggest party of your life, with the world watching you live your best life? Frankly, it’s the ultimate power move.